Want to buy Snap’s Spectacles in New York? Be ready for long lines and a wait. 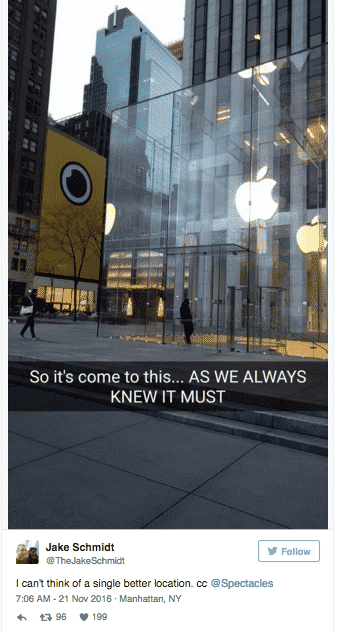 Snap’s New York City pop-up store opened on November 21 at 5 East 59th Street (near 5th Ave). It’s one of the few venues where you can buy Snap’s new Augmented Reality Glasses. The other sites are in Venice and Big Sur in California, Tulsa, Oklahoma and a store near the Grand Canyon. If you know New York, you’ll realize the pop-up is right next to Apple’s iconic flagship store on 59th Street and 5th Ave. In fact, approaching Apple from Midtown, you’re more likely to notice the large Snap facade instead of the Steve Job’s designed minimalist glass entrance to the Apple Store. Yes, heads would have rolled in Cupertino if Jobs had even seen this. The store is open now through New Year’s Eve and that’s it. No word on when Snap’s Wearable Tech will be more widely available. Obviously, this is a marketing stunt, not an effort to roll out a consumer device. But if the lines are any indication, Snap may have a hit on their hands. That is, once people can get their hands on them. If you really want Snap’s new Augmented Reality Glasses, get there early. The line for the store runs around the block before the doors open. And they close – as the security guard told me on Tuesday – “more or less when they feel like it”. If you get a wristband you get in. Otherwise, come back tomorrow. In other words, Snap embodies the antithesis of the Apple retail experience. The pop-up store has a single “Snapbot” vending machine to dispense the sought-after Wearable for $129.00. And if the long wait isn’t frustrating enough, many customers find their credit cards declined. It turns out that banks flag high-priced purchases from vending machines. That means customers have to step out of line, call their bank and then cut back in and try again. Advice for those going this week: call your bank or card issuer while you’re standing in line. 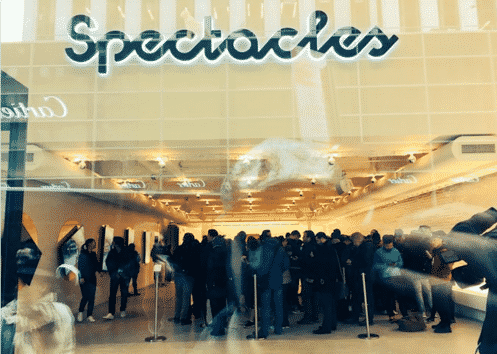 The difficulty of buying Snap’s Spectacles, has created a flourishing resale market. The going rate seems to be around the $400-$500 range on eBay. Some are resold immediately as people exit the store. There’s a limit of two glasses per person and it seems that many people buy two and sell one. In effect, they get their AR Glasses for free and a couple of hundred in cash back. YouTube vlogger Jesse Wellens was one of the first. He showed his 10 million subscribers that using the specs without anyone knowing just requires a little electrical tape and enthusiasm. In a recent video, Wellens places black tape over the LED lights at the top corner of the glasses that indicate the device is filming. 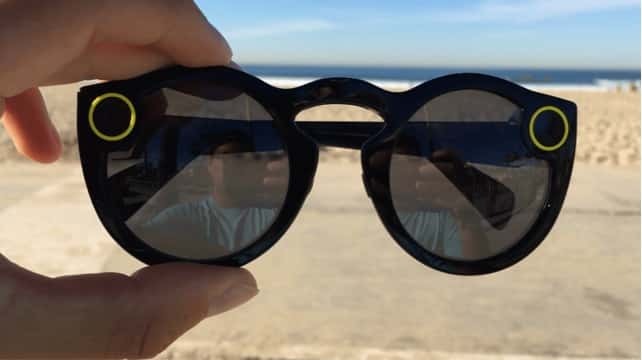 He floats around Venice Beach wearing the sunglasses, casually recording his interactions with unaware friends and bystanders. We already live in a world of unannounced security camera recordings. With wearables, causal video recordings will be everywhere. Long lines and limited availability aside, we’re looking forward to watching how the public takes to Snap’s new wearable. There’s been some complaints about the current color options but that’s easy for Snap to resolve. The AR Glasses let you take thirty seconds of video hands-free and upload it to your SnapChat app on your phone. You can see our initial review back in September at SnapChat Spectacles – a Fascinating Development. Spectacles are the antithesis of Google Glass, Google’s first attempt at Wearables. Snap’s AR glasses are an inexpensive, everyday device that integrates with a single social platform. Just as no one sees Disney’s Magic Band as a wearable tech device, no one will look at Spectacles and see technology. They’re just a pair glasses that enhance your social media presence. Come next summer, we wouldn’t be surprised to see Spectacles everywhere. For now, we’d just like to get our hands on them.